Lewis Burchnall. photo: John Aron. The Wongers are looking to book a place in their second final of the season on Saturday as they host Lincoln United Development Squad in the Challenge Cup semi-finals. 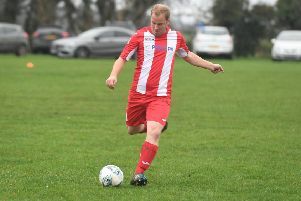 This weekend’s draw at last season’s Lincs League champions Ruston Sports was dampened by a late leveller, but manager Stones believes his back line is coming good when they are needed most. “Defensively, that’s the best we’ve been all season, especially in the conditions in the first half,” he said. The Wongers also welcomed keeper Lewis Burchnall back from injury on Saturday, regaining his place from tenage stand-in Jake Frestle. “Jake’s been brillinat for us, but I’ve said it before that we believe Lewis is the best keeper in the league by a mile. 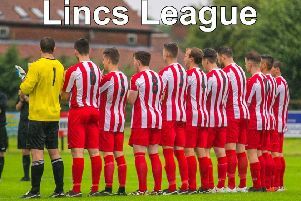 Town will face Brigg Town CIC in the final of the Lincs Junior Cup, and are hoping to make the final of the Challenge Cup for the third year in a row. The Wongers beat Brigg in the 2017 final, Stones’s first trophy as manager, but were pipped by Immingham last season. Lincoln United DS stand in their way, Horncastle registering a 2-1 win over them at Ashby Avenue at the start of the month. “If we can play as well as we’re capable of then we’re confident we can beat them,” Stones added. “It’s a really important competition for us. We can’t put everything into the county cup. Kick off at The Wong will be at 2.30pm.